The North Carolina Visitor Study Pilot Program was a partnership between the Center for Sustainable Tourism at East Carolina University and Chatham, Chowan, Duplin, Halifax, Johnston and Pender Counties. In doing so, develop a streamlined process for collecting this data. It was the hope of all the project partners to create a system where market intelligence could be gathered and analyzed at a very low cost to the destination marketing organization (DMO). 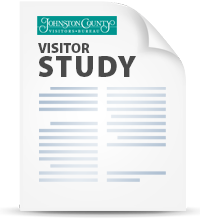 Each county DMO worked with attractions, businesses, and other sites within their community to collect email addresses of the visitors so that an online survey was sent to them. Employees from the various sites collected email addresses, which were then sent to the Center for Sustainable Tourism. Researchers at the Center entered the addresses into a spreadsheet and emailed the survey to the willing participants. One week after initial contact with the visitors a second email was sent out to remind respondents to take the survey. For the purposes of this report, "n" was the number of visitors that responded to each question. Most respondents for this cumulative report visited the county in between July 1st, 2011 and September 30th 2012. Additional responses for this report (n=42) were collected through an inquiry conversion study, which was conducted between November 12, 2012 and December 18, 2012.